Beautiful pumpkins are available throughout the year here. They are so versatile and incredible for making any dishes. I used a small amount of pumpkin puree to make a chiffon cake, that produced a very attractive, natural orange-red colour. The cake's texture is very light and fluffy. Yes, I'm a big fan of light and fluffy cakes. The recipe is adapted from a Taiwaness cookbook writer 薛妃娟. She really knows how to make good use of natural and healthy ingredients and bakes delicious chiffon cakes. The nutrients of pumpkin and pepitas are well known. Guess that I don’t need to explain. Diced pumpkin. Steam over high heat until cooked through. Press with a spoon or process in a small food processor into paste when it's still hot. Mix milk, oil and Cointreau in a bowl. Bake the pepitas in an oven preheated at 150C/300F for 4 to 5 minutes, until expand. Combine pumpkin puree into milk, oil and Cointreau mixture. Mix in cake flour. 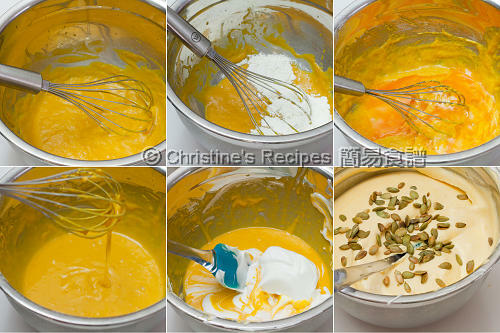 Add egg yolks in pumpkin mixture. Combine well. Spoon out 1/3 of the beaten egg whites and mix into the pumpkin batter. Add the pepitas into the batter. Mix well. Pour batter into the cake pan. Level the surface with a spatula. Use hands lift up the pan with thumbs pressing the tube in the middle. Lightly tap the pan on a table top to get rid of any trapped air bubbles inside the batter. Bake in a preheated oven at 180C/356F for 10 minutes, or until lightly brown. Decrease the oven temperature, 150C/300F upper, 170C/335F lower, continue to bake for about 15 to 20 minutes. Use a long and fine knife to loosen the sides of the cake. Remove from the pan. When the pumpkin is cooked, discard excess water. Otherwise, it affects the texture of your cake. If your oven don't have separate heaters, use 170C/335F to 180C/356F to bake the cake for about 30 to 35 minutes. In the process of baking, if the surface gets brown too quickly, loosely cover with foil. My oven doesn't have separate heaters. I baked my cake at 180C/356F for about 10 minutes. Then reduced heat to 150C/300F-160C/320F, continued to bake for another 20 minutes. I didn't cover my cake with foil. It worked well. Mind you: the design and power of every oven is very different. Know your own oven. The pumpkin sure gives a lovely orange shade to your cake and it looks so soft and fluffy! You know I am a fan of chiffon cake. But I never tried a pumpkin chiffon cake before. Your cake looks great and definitely nutritious! Have a pleasant weekend! A wonderfully light and delicious looking cake! I love the pepitas in the cake, great texture addition! the chiffon cake look like light fluffy golden pillows! yummy! This looks so soft and spongy! what a lovely color and such a light cake. I love light and fluffy cakes too, but have never seen a recipe quite like this. It looks amazing! And such color! Have bookmarked this recipe. I like the colour of the cake and pumpkin is very nutritious too. Thanks for sharing and also your cooking tips! your chiffon looks amazing and i love the bright yellow colour of the pumpkin..i spotted some cointreau too! wow, must be really good! I have a pumpkin chiffon cake recipe to test out as well :) Yours look lovely! love the vibrant and cheery orange hue ... natural food colouring is the best. Your cake looks so fluffy. I love the colour of the chiffon! 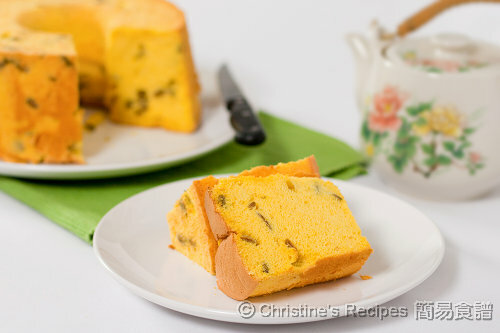 My family members only ever want to eat chiffon cake...I bet they'd love this one! thanks for the inspiration! No problem. You can omit the Cointreau or replace it with vanilla extract. The canned pumpkin will work too. 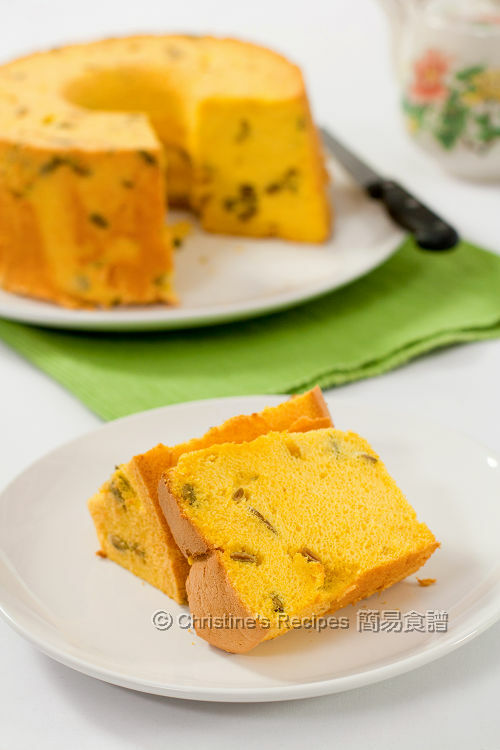 Hi~ Your pumpkin chiffon cake looks wonderful! Do you know if I can omit the Cointreau because I don't have any! Yes, you can skip the Cointreau, or substitute with vanilla extract. That cake looks lovely, I'll be sure to try this over the weekend. I noticed that most Chiffon cake uses tube pan. Can I just use a normal round pan instead because I do not have any tube pan? I noticed that all Chiffon cake uses tube pan. Can i Just use a normal round baking pan? The cake baked with a regular pan tends to shrink back, especially the middle part. That's why many people use tube pan to make chiffon cakes. 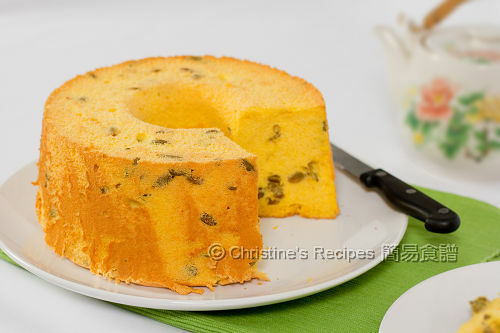 I love chiffon cake and that is a perfect looking one!